Some people claim the moon is made out of cheese. Dean Martin famously sang that it can hit “your eye like a big pizza pie.” Earlier this year, we discussed an artist who re-created the lunar cycle out of Nilla Wafers. The moral: On many evenings, people have looked up to the moon and thought of food. Maybe they were just hungry, or maybe there really is something to it? The South Korean company Tale Design has taken some fun foodie inspiration from the moon as well. The brand created what they call the “Moon Glass”—a ceramic liquor glass intended for traditional rice wine. Though relatively normal looking from the outside, when you drink from the glass, its ingenuity is revealed: As the liquid inside lowers, the glass displays different moon phases, from full to new and all the stages in between. 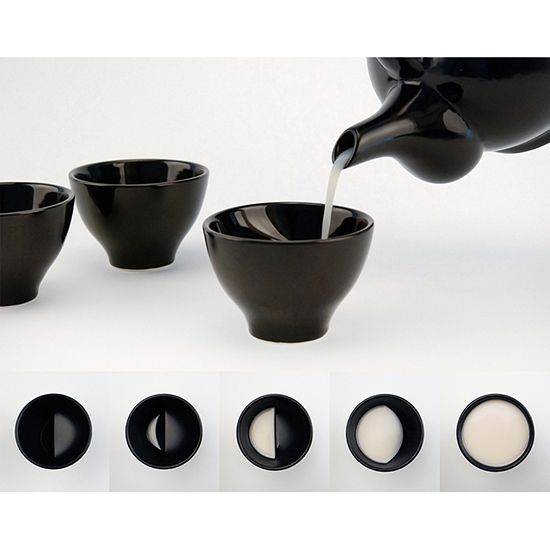 The secret is a special curvature within the cup that makes the transitions possible. Sets of two can be ordered for $24 or $30 (plus shipping) depending on what size glasses you prefer. Then might I suggest pairing your rice wine with a moon pie?